This erect herb has sticky hairs stems and leaves. 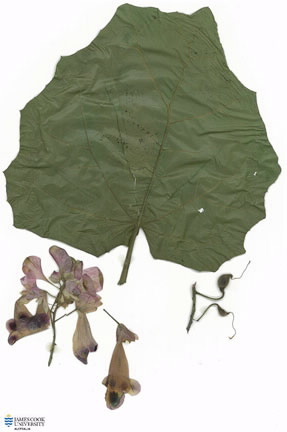 The leaves are opposite up to 12.5 cm diameter, somewhat triangular to orbicular in shape with 5-7 shallow lobes. Flowers in racemes, corolla tubular, lobes unequal, purplish-pink with darker blotches. The distinctive fruit initially has a fleshy outer part this falls off leaving a woody layer with crests and spines, this fruits then splits into two and the beak then forms two horns. These clawed ‘fruits cause damage to anything walking on them.